The Koala was unconvinced and secretly glad there were no kale chips left. Even I’m not convinced, but I did eat all of them before I realised what was happening. A good way to get rid of an abundance of kale I guess. This recipe is easy and you might as well give it a try if you have kale. Maybe you’ll like it. Or maybe you’ll find that you ate the lot before you could decide if you liked kale chips or not. Just make sure you keep a close eye on these suckers in the oven because they can burn in a heartbeat. 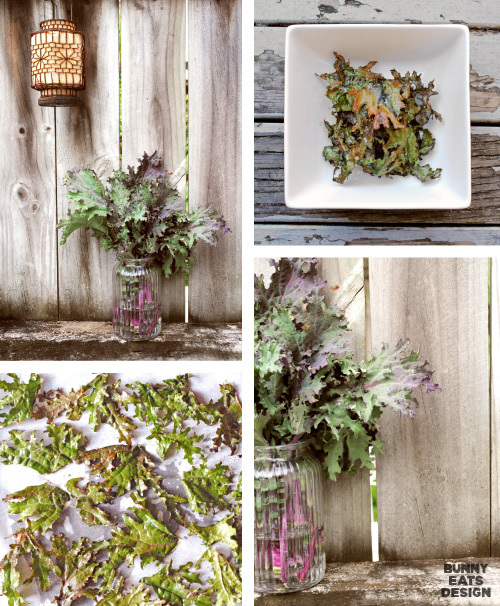 Pick the leaves from the kale stalks and discard the stalks. Tear the leaves into chip sized pieces. Wash thoroughly and pat leaves dry with a clean tea towel. I lay down a layer of kale at a time on one half of a tea towel, then fold over the tea towel and rub my hands over the towel until the kale is dry. Place dry kale in a large bowl, add oil and seasonings. Combine using your hands so that the kale is thoroughly coated in oil and seasoning. On a baking sheet, lay down a layer of baking paper and then arrange seasoned leaves in 1 layer. Bake for about 10 minutes or until the edges of the leaves start to brown. It’s very easy to burn these so keep an eye on them. Remove chips from tray and place in a bowl. If they aren’t quite crunchy, don’t worry, they seem to crisp up on their own. Repeat until all leaves have been baked. Week 2 of our CSA box was good. I wrote a meal plan for the first time and pretty much kept to it. I think I’ll write a new meal plan tomorrow for Week 3. If anything, it will be a good guide to figure out how to get through Week’s 3 huge bounty of vegetables. Week 2 was our second week of eating lots of fruit and while I’m sure it’s been good for us, our fruit eating has definitely waned. So for Week 3, I’ve changed our order from the original box of fruit and vegetables to vegetable only. This means double the amount of vegetables and no fruit. Just as well because we still have kiwifruit left over from Week 2 as well as the extra bananas we purchased. Last week we received kale. As mentioned before, kale seems to be a CSA star. Everyone in the world gets kale in their CSA box at some point and there’s no shortage of recipes on the net. It’s supposed to be crazy good for you and that always impresses me. I really think that we should be eating smarter. The red russian kale we got last week looked cool with it’s purple stems and purple tipped leaves. I sauteed the kale with balsamic and apple and I also baked it into chips. The Koala didn’t love kale, but thankfully, Tofu the rabbit seemed to enjoy the leaves. No one liked the stalks. Not even the rabbit. I’ve joined a CSA box link party. A link party is a weekly or monthly round up of relevant blog links in one handy place. Anyone can submit their posts and if you are interested in CSA and what see what other people around the world are getting each week in their boxes, have a look at blogger In Her Chuck’s CSA box Link Party here. Last week there were 56 submissions from around the world. I am in no way affiliated with OOOOBY and we paid for our box and add-ons with our own hard earned money. This is a review and not an advertisement. But if you would like to join OOOOBY, contact me about their their refer-a-friend scheme and we’ll both get a free loaf of bread each. Your choice of kumara sourdough, ciabatta, mixed grain or even gluten free. Choice! Love what you are making with these OOOOBY boxes. I also think OOOOBY is the best name/acronym ever! I made kale chips about 5 years ago ( I know it’s five because it was before we renovated the kitchen). We ate the batch too and decided it was too much effort for the value. They were fine, but. A couple of years ago we were approached to design packaging for a start up selling vegan kale chips, sadly she had no money. We didn’t end up doing it. Too bad it could have been fun. Your veggy boxes sound great (half a cauliflower? Who ate the other half?) I made a Niçoise salad for dinner tonight and our lunches tomorrow. We broke record highs in Toronto today (40C+), the steer car was brutal coming home; I was wetter than after my workout this afternoon, gross. I can’t imagine commercial kale chips to be a very profitable venture. They weigh nothing and people want to buy by weight. I imagine some other family at our other half cauliflower. It’s ok though, we only just managed to finish our half last week. We would have had to really work at it to finish a whole one. Yum! I love the idea of cauliflower and chipeas. So perfectly scrummy to soak up curry flavours. It’s one of our favourites. I heard about kale chips a lot but never make them, but I guess that the only kale I have is cavolo nero, and it is too precious to be made into chips… although… maybe one day i will try, just our of curiosity :-). Thanks for the shootout! Those kale chips look scrumptious 🙂 Red russian kale is my favorite. Love the pics too! I love kale chips! I buy them too, but have made them before. I find that the Red Russian variety of kale doesn’t come out very good, and since that’s what is abundant here, I started buying them instead. I’m not sure what variety my store bought brand uses, but they taste so much better! Hey that’s good to know Cristina. I’ll keep an eye out for different varieties of kale. I can’t say I’ve ever seen kale chips for sale here. Most people around here don’t know know what kale is.